Well, show host Ellen DeGeneres has been and gone. She came to Australia in March 2013 for a brief stint, visits to Sydney and Melbourne, a couple of appearances (MLC) and taping of a live show. If you gauged her popularity on numbers in Australia, then she has a wide demographic (12-80) of mainly female fans. Given her shows are watched by under 100K viewers in a country of over 20M, means her show isn't that popular. Her popularity may be due to her unique dance style, it may be her lifestyle choice (married to a woman), it may be the woman she is married to is an Australian (Portia de Rossi aka Amanda Lee Rogers), either way, it goes to show 'every star' has fans. The rest of this page is the changing details of Ellen's visit to Melbourne in March 2013. In case, you live under a rock and missed the Oprah-esque announcement.. Ellen talking to her studio audience shouted... we're all going to Australia! American talk show host Ellen DeGeneres is coming to Australia in March 2013 and so are 400 of her excited audience members. But it won't be like the Oprah trip, when the star and the audience travelled here together and became part of the show. The Ellen DeGeneres Show will not be recorded in Australia. Instead, she will film segments in Sydney and Melbourne to be played on her program at a later date. The audience each received an airline ticket to travel to Sydney or Melbourne on any date in the next 12 months with six nights' accommodation at a four-star hotel. The Ellen DeGeneres Show (or segments will be filmed in Melbourne on Tuesday 26th March 2013 from 8am. People have been asked to come dressed in costume (weird, whacky, graffiti, urban art) with prizes for the best costume. How get it in: Be there early. Talk show queen Ellen DeGeneres is bringing her top-rating show to Australia in March, the first time she has filmed her show outside the US. Despite being married to Melbourne girl Portia de Rossi (Amanda Lee Rogers*), it will also be the first time she has ever set foot in the country. The 13-time Emmy Award winning entertainer announced the Aussie visit during the taping of her show in LA this afternoon. The episode, featuring Academy Award winning actress Nicole Kidman, goes to air in the US tomorrow and Australia on Monday. Studio audience members were thrown into a screaming frenzy when DeGeneres revealed they would all receive airfares and accommodation to experience their own Australian adventure. 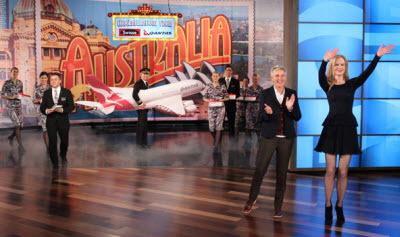 The Ellen DeGeneres Show's visit to Australia is part of a promotional deal with Swisse and Qantas. * Melbourne girl Portia de Rossi (Amanda Lee Rogers) is actually from Horsham and was raised in Grovedale (Geelong).